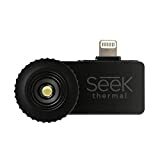 There is nothing you’ve seen that’s quite like the Seek Thermal Compact Imager for iOS-Apple. This odd-looking attachment connects to the Lightning port on your iPhone, instantly transforming your handset into a thermal imaging device. That means you’ll be able to see all sorts of heat sources that would otherwise be invisible to the naked eye. Yes, that also means you’ll be able to see people and animals at night in the pitch black darkness! It’s an awesome camera, and it’s discounted right now on Amazon.